Most small businesses use invoices for billing customers. But there are times when you may want to send statements instead of — or in addition to invoices. This is where the QuickBooks Statements feature comes into play. Need a historical accounting of a customer’s activity, including charges, payments, and balance. There may be occasions when you want to create a form that lists invoices received, payments made, and any credits given for one or more customers. This may be necessary when, for example, a customer is disputing a charge. You may also want to send out these statements generated from the QuickBooks Statements feature to remind customers of delinquent payments. You do not have to enter any new data for these statements. Instead, QuickBooks will pull the existing activity that you ask for in the Create Statements window, shown below. To get there, either click on the Statements icon on the home page or open the Customers menu and select Create Statements. Figure 2: The Create Statements window in QuickBooks offers multiple options for defining the statements you want to send to customers. The active date range. 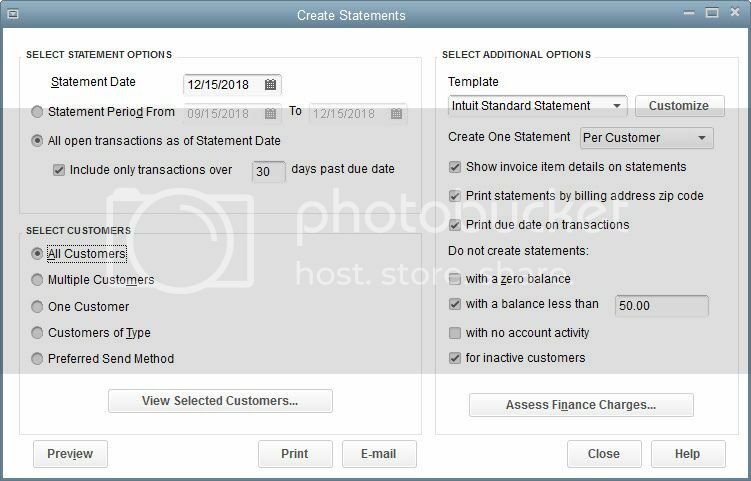 Under SELECT STATEMENT OPTIONS, you can either enter a date range or request a statement for every customer who has open transactions as of the Statement Date (be sure that this date is correct before proceeding). You can also ask to include only transactions that are past due by a specified number of days. The customers to include. Do you want to use the conditions you just outlined to apply to All Customers? If so, click on the button in front of that options. If you choose Multiple Customers, a small button labeled Choose… will appear. Click on it, and a window displaying your customer list opens. One Customer also opens your list of customers. If you’ve assigned types to your customers and want to include only those in one category (like Residential or Commercial), click Customers of Type. And Preferred Send Method lets you limit your statement output to customers who receive either emailed or printed forms. The template to use. Click the down arrow to see the statement templates available. If you have not customized QuickBooks’ standard form and want to do so, let us help. Whether QuickBooks prepares one statement per customer or per job. This is a very important distinction, so choose carefully. Miscellaneous attributes of your statement run. Click on the box in front of any that should apply. If you assess finance charges, you can do so here. This is an advanced activity in QuickBooks, and we’d be happy to provide guidance in this area. When you’re done, you can Preview your statements, Print, or E-Mail them by clicking those buttons. If you need to enter individual charges, you’ll have to work with QuickBooks’ customer registers. You’ll find these by either opening the Customers menu and selecting Enter Statement Charges or highlight a customer in the Customer Center, then click the down arrow next to New Transactions and select Statement Charges. Figure 3: A Statement Charge in the customer register. We highly recommend that you let us help you get started if individual charges are necessary. Like many of QuickBooks’ functions, this isn’t a difficult activity once you understand it. But it’s much easier and economical for you to get upfront guidance than for us to come in and untangle your company file. Want to add a “pay now button” on the bottom of a statement? All you have to do is combing QuickBooks Payments with Bill & Pay. Click here to learn more. Need help with setting up or using statements? Click here to schedule an appointment to discuss options.